You’ll learn one permanent makeup skill and semi permanent eyebrow microblading during this course. You can choose from the following PMU electives: lips, eyeliner, or microneedling. 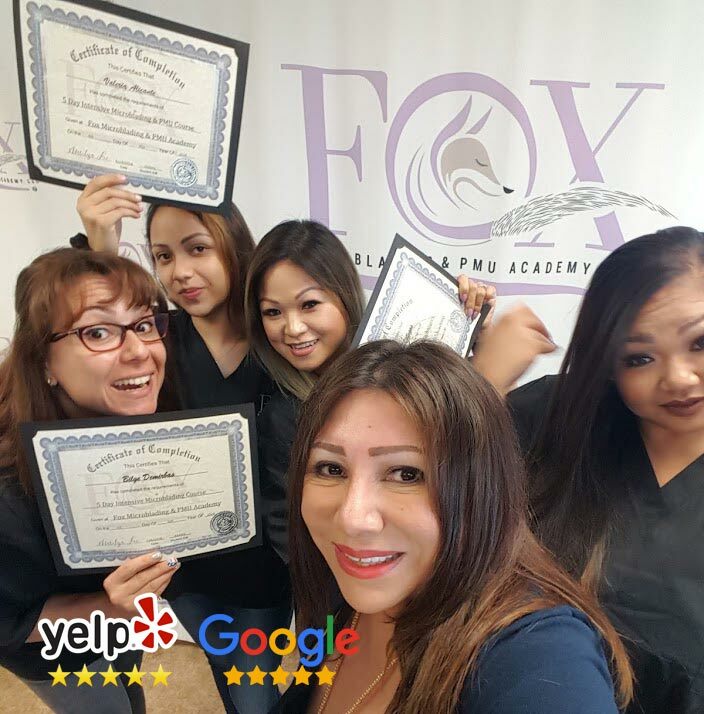 The certification program teaches basic and advanced permanent makeup as well as 3D eyebrow microblading. Your tuition also includes a full apprenticeship in addition to your Microblading & PMU Certification. Take a Virtual Tour of Fox Academy! Our Permanent Makeup Certification Course is conveniently located in the city of Huntington Beach California. We are just 15 minutes away from the 405 Freeway, Long Beach, and other major cities in the greater Los Angeles Area. Our beautiful studio is the perfect place to learn Microblading and Permanent Makeup. Our certification course includes an extensive curriculum that covers in depth topics not taught at other schools. Why pay extra for things that should be included in the cost of your certification course? At Fox, we include everything needed to successfully complete this course and practice on up to 20 clients/models. This includes your bloodborne pathogens certificate, microblading kit, and a satisfaction guarantee. You can even retake the course for free in addition our generous package. People love Fox Microblading & PMU Academy. Our permanent makeup clients, students, and models love our work. Our goal is to provide the best quality service and training for students and models alike. Lock in your early registration price with a $500 deposit. Student who register 2 months in advance can save up to $500 off registration fees. Seating is limited so register as soon as possible. Don’t let your future pass you by.